December 1999: Habilitation (Doctor) degree in thermal physics received from the Ural Technical University, Ekaterinburg. 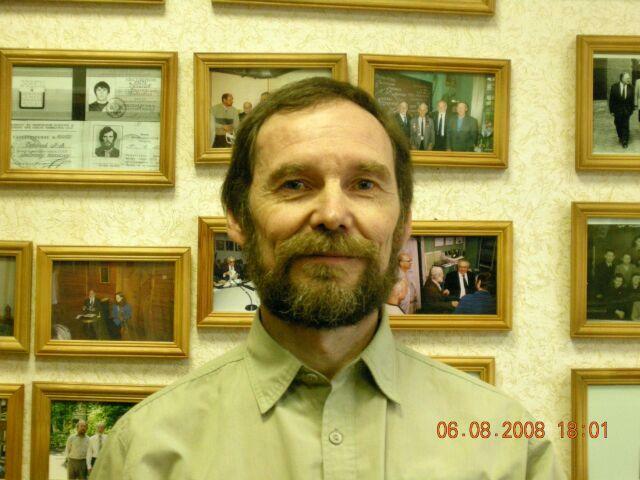 September 2003 – present: Ural Fire Protection Institute, Department of Physics and Heat Exchange, Professor (part-time). Main fields of research: methods and devices for subsecond thermophysics, thermally unstable and superheated states of liquids, including polymer melts and oils, kinetics of spontaneous boiling-up and thermophysical properties of superheated liquids. 1. P.V. Skripov, A.A. Starostin, and D.V. Volosnikov, Estimation of Polymeric Liquids Thermal Stability by Method of Controllable Pulse Heating Zh. Tekhn. Fiz, 69, 12, 92 (1999) (in Russian). 2. P.V. Skripov and S.E. Puchinskis, Explosive Boiling of Polymer Liquids, High Temperature, 37, 584 (1999). 3. A.A. Starostin, P.V. Skripov, and A.R. Altinbaev, Pulse Heating as a Tool to Study the High Temperature Properties of Unstable Liquids, Int. J. Thermophys., 20, 953 (1999). 4. P.A. Pavlov and P.V. Skripov, Bubble Nucleation in Polymeric Liquids under Shock Processes, Int. J. Thermophys., 20, 1779 (1999). 5. D.V. Volosnikov, A.V. Sivtsov, P.V. Skripov, and A.A. Starostin, A Method of Controllable Pulse-Heating for Investigation of Properties of Short-Lived Liquids, Instrum. Exper. Techniq., 43, 1, 134 (2000). 6. D.V. Volosnikov, P.V. Skripov, and A.A. Starostin, Modeling of Thermal Processes in a Metal-Polymer System Using Controllable Pulse Heating Technique, Friction and Wear, 21, 15 (2000). 7. P.V. Skripov, A.A. Starostin, and S.E. Puchinskis, Heat Transfer and Thermal Fracture of Polymers in Pulsed Processes, Doklady Physics, 45, 663 (2000). 8. S.E. Puchinskis and P.V. Skripov, The Attainable Superheat: From Simple to Polymeric Liquids, Int. J. Thermophys, 22, 1755 (2001). 9. P.V. Skripov, A.A. Starostin, and D.V. Volosnikov, Heat Transfer in Pulse-Superheated Liquids, Doklady Physics, 48, 228 (2003). 10. P.V. Zhelezny, V.P. Zhelezny, and P.V. Skripov, Determination of the pseudocritical parameters for refrigerant/oil solutions, Fluid Phase Equilibria, 212, 285 (2003). 11. P.V. Skripov, A.A. Starostin, D.V. Volosnikov, and V.P. Zhelezny, Comparison of Thermophysical Properties for Oil/Refrigerant Mixtures by Use of Pulse Heating Method, Int. J. Refrig., 26 721 (2003). 12. S.N. Vasil’ev, D.V. Volosnikov, P.V. Skripov, A.A. Starostin, and A.V. Shishkin, A Programmable Device for Experiments Employing a Superheated Probe in the Pulse Operation Mode, Instrum. Exper. Techniq., 47, 539 (2004). 13. P.V. Skripov, S.E. Puchinskis, A.A. Starostin, and D.V. Volosnikov, New Approaches to the Investigation of the Metastable and Reacting Fluids, NATO Science Series II: Mathematics, Physics and Chemistry, 157, 191 (2004). 14. V.P. Efremov, V.E. Privalov, P.V. Skripov, P.V. Charty, and V.G. Shemanin, Polymer materials laser destruction thresholds studies, Proceedings of SPIE, 5447, 234 (2004). 15. P.V. Skripov, A.A. Starostin, D.V. Volosnikov, and V.P. Zhelezny, Pulse Method and Device for Fast and Precise Comparison of Oil Properties, Proceedings of the 5th Conference on Compressors and Coolants, Slovakia: SZ CHKT, 231 (2004). 16. D.V. Volosnikov, V.P. Efremov, P.V. Skripov, A.A. Starostin, and A.V. Shishkin, An Experimental Investigation of Heat Transfer in Thermally Unstable Polymer Systems, High Temperature, 44, 463 (2006). 17. V.P. Zhelezny, Y.V. Semenyuk, S.N. Ancherbak, and P.V. Skripov, An Experimental Investigation and Modeling of the Thermodynamic Properties of R245FA/Compressor Oil Solutions, Proceedings of the 6th Conference on Compressors and Coolants, Slovakia: SZ CHKT, 231 (2006). 18. P.V. Skripov, A.A. Smotritskiy, A.A. Starostin, and A.V. Shishkin, A Method of Controlled Pulse Heating: Applications, Journ. Eng. Thermophys. 16, 155 (2007). 19. Y.V. Semenyuk, V.V. Sechenyh, V.P. Zhelezny, and P.V. Skripov, Thermophysical properties of compressor oils for refrigerating plant, Journal of Synthetic Lubrication, 25, 57 (2008). 20. V.P. Zhelezny, Y.V. Semenyuk, S.N. Ancherbak, and P.V. Skripov, Investigación experimental y modelo de las propiedades termodinámicas de las soluciones R245fa / lubricante del compresor localización, Frío-calor y aire acondicionado, 399, 3 (2008) (in Spanish). 21. A.V. Baginsky, D.V. Volosnikov, P.V. Skripov, and A.A. Smotritskiy, Studies of thermal resistance of mixtures in a wide temperature range. 1. Experimental techniques, Thermophys. and Aeromech., 15, 373 (2008). 22. P.V. Skripov , Method of controlled pulse heating: applications for complex fluids and polymers, NATO Science for Peace and Security Series, A: Metastable Systems under Pressure. 2010. P. 323-335. 23. V.P. Zhelezny, Nichenko S.V., Semenyuk Yu.V., Skripov P.V. Experimental Investigation of the Enthalpy of Isobutane – Compressor Oil Solutions, J. Chem. Eng. Data. 55, 2010. P. 1322-1326. 24. Gorbatov V.I., Okulovskii Yu.S., Skripov P.V., Smotritskiy A.A., Starostin A.A. Identification of heat-exchange parameters under intensive pulse heating of a wire in a fluid, J. Eng. Thermophys. 19, № 3, 144 (2010). 25. P.V. Skripov and A.P. Skripov. The Phenomenon of Superheat of Liquids: in Memory of Vladimir P. Skripov, Int. J. Thermophys. 31, № 4-5, 816 (2010). 26. A.L. Gurashkin, A.A. Starostin, G.V. Ermakov, and P.V. Skripov. High speed optical investigations of a character of boiling-up onset, J. Chem. Phys. 136, 021102; doi:10.1063/1.3678831 (2012).